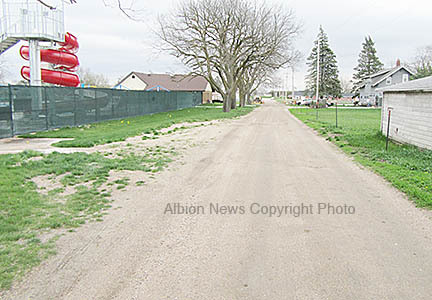 Full width of South Street will now be paved past the Albion Family Aquatic Center. Albion’s Eighth and South Streets paving project expanded with action by the Albion City Council last Friday morning, April 22. The city will now be paving the full width of South Street, from the Eighth Street intersection to the western city limits entering the fairgrounds. The council approved an improvement agreement with Dana and Karen Andersen, whereby they are dedicating a portion of what is now used as South Street for a public road. Details in the April 27 Albion News Print & E-Editions.